3 - 2..........Satan von Ellendonk. 3 - 2..........Blanka von der Au. Enka von der Fliehburg was titled to Schutzhund III and FH in Australia. Her sire, Ali von Langenhorst, passed the Körung 'for life' with highest rating for hardness and working drives plus was a winner of numerous German and International show championships. Her dam, Bessy von Niederkassel, passed the Erstkörung at 2 years of age with highest rating for hardness and working drives (very high protective instinct and very high courage). 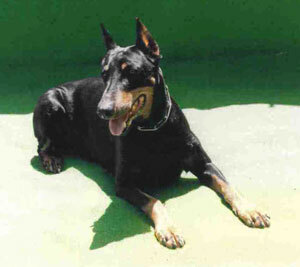 Arod: sire of the Vonforell “J, Q” litters (Janka, Quecka).